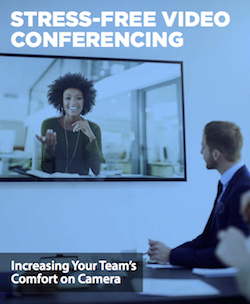 It should shock no one that video conferencing technology is an amazing tool to connect and engage with business contacts in a more personal and effective way. In fact, only 7% of how we communicate is through words, whereas a whopping 93% is through tone of voice and body language. To further the strength of video conferencing, 99% of professionals feel that by improving communication and collaboration, productivity will be positively impacted. However, many people are concerned with how they come across on camera... So we've put together a handy guide for you to turn to when looking to invest or upgrade your video conferencing solution titled Stress-Free Video Conferencing.